To power whole communities with clean energy, such as wind and solar power, a reliable backup storage unit is required to provide energy for times when the wind is not blowing and the sun is not out. One option is to use any extra solar and wind-based energy to charge solutions of chemicals that can then be stored for use when wind and sunshine are scarce. During these down times, chemical solutions of opposite charge can be pumped across solid electrodes, thereby forming an electron exchange that provides power to the electrical grid. The main factor to this technology, called a redox flow battery, is detecting chemicals that can not only “carry” enough charge, but also be stored without degrading for long periods, thus making the most of power generation and minimizing the costs of replenishing the system. A team of researchers at the University of Rochester and University at Buffalo believe they have found a favorable compound that could transform the energy storage domain. In a paper published in Chemical Science, an open access journal of the Royal Society of Chemistry, the team describes altering a metal-oxide cluster, which has potential electroactive properties, so that it is virtually twice as effective as the unchanged cluster for electrochemical energy storage in a redox flow battery. The study was led by the lab of Ellen Matson, Ph.D., University of Rochester assistant professor of chemistry. Matson’s team partnered with Timothy Cook, Ph.D., assistant professor of chemistry in the UB College of Arts and Sciences, to develop and explore the cluster. “Energy storage applications with polyoxometalates are pretty rare in the literature. There are maybe one or two examples prior to ours, and they didn’t really maximize the potential of these systems,” says first author Lauren VanGelder, a third-year Ph.D. student in Matson’s lab and a UB graduate who received her BS in chemistry and biomedical sciences. “This is really an untapped area of molecular development,” Matson adds. However, by making what Matson defines as “a simple molecular modification” — substituting the compound’s methanol-derived methoxide groups with ethanol-based ethoxide ligands — the team managed to expand the potential window during which the cluster was stable, amplifying the quantity of electrical energy that could be stored in the battery. 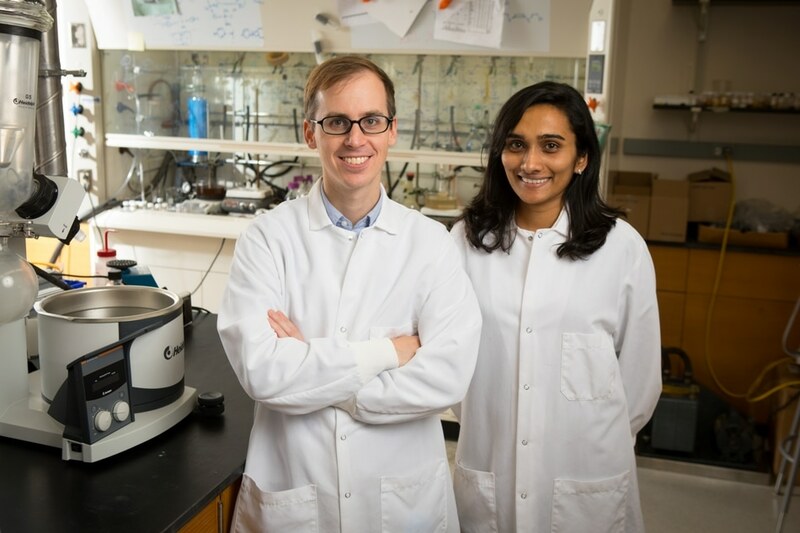 Cook’s team — including fourth-year Ph.D. candidate Anjula Kosswattaarachchi — contributed to the research by conducting tests that enabled the researchers to establish how stable various cluster compounds were. “We carried out a series of experiments to evaluate the electrochemical properties of the clusters,” Cook says. “Specifically, we were interested in seeing if the clusters were stable over the course of minutes, hours, and days. We also constructed a prototype battery where we charged and discharged the clusters, keeping track of how many electrons we could transfer and seeing if all of the energy we stored could be recovered, as one would expect of a good battery. Matson and Cook’s research groups have applied for a National Science Foundation grant as part of a continuing collaboration to additionally refine the clusters for use in commercial redox flow batteries. A University of Rochester Furth Fund Award that Matson received last year facilitated the lab to purchase electrochemical equipment necessary for the study. Patrick Forrestal of the Matson lab also contributed to the research.